This online student handbook directs you to the location on the College website where you will find information about important College policies related to student life. The college reserves the right to change any policies, rules or regulations affecting students and any dates reported herein. Each student is expected to have knowledge of the information contained in College publications and on the College website. Questions about College policies can be addressed to the dean of students, Campbell Student Union, Room 311, telephone - 716-878-4618. Buffalo State requires all students to receive and positively affirm the College's code of student conduct. This section describes the procedures required to complete the affirmation process. The Code defines student rights, freedoms, and responsibilities as a member of the Buffalo State campus community and identifies conduct that is not permitted. The intent of the Code is to provide students with a due process review of allegations that the Code has been violated and delineates sanctions when guilt has been determined. Students must follow the procedures described in this policy for resolving academic grievances, including alleged violations of college and/or course policies or unfair treatment in violation of established academic policy or practice. All students are expected to display honesty and integrity in completing course requirements and following academic regulations. The Academic Misconduct Policy defines the procedures and processes to be used when allegations of plagiarism, cheating, or other academic misconduct arise. The College does not have a uniform attendance policy. Individual faculty members define the attendance requirements for their courses. This section describes the procedures for students to follow when they wish to provide faculty with notice of absence for legitimate reasons. This website details the guidelines and requirements students must follow when using campus e-mail. Advisory Regarding Online Postings Community members are reminded that images, postings, dialogues, and information about themselves or others posted on the internet (e.g. on social networking sites such as MySpace and Facebook) are public information. This advisory contains guidance regarding the appropriate use of technology and possible consequences for wrongful use. Parental Notification Policy Buffalo State reserves the right to notify parents or guardians of students under the legal drinking age who have violated campus alcohol and other drug prevention policies. This section describes the parental notification policy. Criminal Incidents and Other Emergencies - Reporting Procedures This section details procedures to follow when reporting a crime or serious incident to University Police by calling the main University Police number at (716) 878-6333. Emergency closing information can be obtained at this site. Visit this web site to learn about and sign up for NY-Alert, a service that sends emergency messages via text, voice, or e-mail. These guidelines describe how the College carries out its responsibility to enforce New York State laws regarding sale, use and distribution of alcohol on campus. Annual Security Report Information about campus safety and security is available from the office of University Police, including tips for keeping safe on campus and in the community. The office of University Police is mandated to protect all members of the campus community by preventing and prosecuting bias or hate crimes that occur within the College’s jurisdiction. This section describes procedures to follow if you are the victim of or witness to alleged hate or bias-related crimes. The Campus Safety Forum is the College’s advisory committee on campus security and reviews current security policies and procedures and makes recommendations for their improvement, especially with regard to preventing and responding to sexual assault. The unlawful use, possession, manufacture, or distribution of controlled substances and alcohol on college property or at a college-sponsored activity is prohibited. Information about this policy, the health risks of using alcohol and other drugs and where to get help can be obtained at this Web site. This section describes how to obtain information from the annual report of campus crime statistics, as provided to the U.S. Department of Education, through the office of University Police. University Police and the College Community Relations Advisory Council work with area law enforcement to help provide a safe environment for students, both on- and off-campus. This section details procedures to follow when reporting a crime or serious incident to University Police by calling the main University Police number at 716-878-6333. This web site provides students with information about the Federal trafficking penalties applicable to persons found guilty of various drug offenses. Investigation of Violent Felony Offenses/Missing Students The office of University Police is responsible for the investigation of any violent felony occurring at or on the grounds of the College and for the investigation of any missing student. Information about the plan for conducting such investigations is available at this website. Maintenance of Public Order This policy outlines the rules for the maintenance of public order (including prohibited conduct), freedom of speech, assembly, picketing and demonstration on campus, along with penalties for violation of the rules. Discrimination and Harassment Policy Buffalo State is committed to the need for proper treatment of all members of the college community. This section describes the College’s discrimination and harassment policy and the procedures to be followed for its implementation. It is the policy of Buffalo State that no otherwise qualified person with a disability shall, solely by reason of the disability, be excluded from participation in employment or access to programs of the college. This section describes the policy and identifies resources available to support and assist persons with disabilities. Religious Observance Policy Under New York State Education Law, no person shall be expelled from, refused admission to, or denied registration for or the right to attend classes or to participate in any examination, study, or work requirements on a particular day or days because of his/her religious beliefs. The complete religious observance policy is available in this document. Recognition and Governance Policies Recognition is the process by which the College agrees that a social fraternity or sorority may function on campus, enroll members, and identify with the College. This section defines the policies and procedures to be adhered to by all Greek organizations on campus. Hazing Policy Hazing is illegal in New York State and the college strictly enforces the State's anti-hazing law. The law is described here, along with examples of behavior that constitutes hazing activity. All full-time domestic undergraduate and graduate students who attend Buffalo State are eligible and automatically enrolled in the college’s student health insurance plan unless an online waiver form with proof of health insurance coverage is completed by the applicable deadline. This document explains the health insurance program and provides information about the costs and benefits of student health insurance. All students must be in compliance with New York State law regarding immunizations. Measles, mumps, and rubella immunizations are provided at no charge at the center. Students must be in compliance to register for classes. It is the policy of Buffalo State that all buildings and grounds, including indoor and outdoor areas that comprise the Elmwood Ave. campus, and any off-campus affiliated facilities and geographic locations, are to be tobacco-free. Public Information/Directory Information Policy This policy defines student information that may be disclosed by the College for any purpose, at the College's discretion. This includes student address and telephone information that is displayed in the on-line student directory. Further information is provided describing how to withhold information from being disclosed in the on-line directory. Residence Life Policies and Services This website contains the policies and procedures governing residential life at Buffalo State. Each residential student and visitor to the residence halls is expected to have knowledge of and abide by the information contained in these policies. Sexual assault can happen anywhere, at any time, to anyone, male or female. This web site describes the College’s commitment to prosecuting allegations of sexual assault through the student judicial process, defines the legal provisions of New York State law related to crimes of sexual assault and provides guidance on what to do if you are sexually assaulted. Sexual harassment is an affront to human dignity and will not be tolerated at Buffalo State College. This website describes the policy and procedure to be followed in responding to allegations of sexual harassment involving students, faculty, and staff. 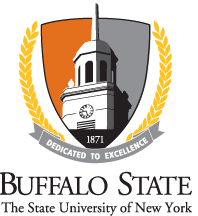 Buffalo State will take affirmative action to protect persons from judgments related to sexual orientation. This website describes the College’s policy and assistance available to persons who allege discrimination based on sexual orientation. Consensual Sexual and Amorous Relationships Policy This website describes the College's policy and procedure with regard to relationships that arise between students and faculty or staff members where one party is in a position of power and authority and appears to abuse that position. Voter Registration Procedure Voter registration information is available at this website. To ensure the educational integrity of co-curricular activities on campus, the College has established registration procedures for student organizations. Student Organizations include clubs, organizations, fraternities, sororities, and honorary societies. The Office of Student Life is responsible for oversight of the registration process for student organizations and all student organizations must complete the registration process in order to be recognized as an approved student organization. Recognition procedures are not the same as registration procedures. Recognition procedures of certain organizations are outlined by the appropriate support department and/or student government. Any student organization seeking recognition by the appropriate support department and/or student government must first receive registration approval by the Student Life Office. The Student Life Office is responsible for this oversight. Students are prohibited from affiliating with any purported student organization or group that is not currently registered with the College or has had its College registration withdrawn. For purposes of this policy, affiliation includes but is not limited to joining; recruitment/rushing; engaging in new member initiation/intake/pledging; accepting an offer of membership; residing in facilities that are owned, rented, or controlled by the group; or being involved in any activity that would normally be associated with being a member of the group. Student organizations found responsible for violating college policy may lose their registration at the discretion of the President or designee of the College. Students found responsible for violating this policy are subject to conduct referral to the College Judicial System, which may result in disciplinary action up to and including suspension or dismissal. Organizations in violation are subject to denial of future registration requests.